The Creative Kat – Etsy Shop! A couple of my friend’s and I are planning a pizza party later in the month since we’ve all been on a quest to learn how to make good pizza at home. I’ve been making my own pizza for a while now, but it’s always fun to try out new pizza dough recipes. I’m in charge of bringing dough to the party, so I’m trying out a few different recipes to find the best one. First up is Jim Lahey’s No Knead Pizza Dough. Check out his recipe and video. His key to good pizza crust is handling the dough gently and baking at a high temperature. The recipe says that it makes enough for 4 pizzas, but those would be very small pizzas – good for personal size pizzas. I cut the batch in half and made one normal sized pizza out of the half batch. Like no-knead bread recipes, the dough needs to rise for a long time. I made the dough a day ahead of time and let it rise about 18 hours. I put my pizza stone in the oven and set the oven to preheat to 500°. I tried stretching the dough out like he shows in the video, but my dough turned out fairly sticky and fragile, so I couldn’t stretch it by hand without it breaking. Next time I will try cutting back on the water a little to see if it turns out a little less sticky and easier to work with. I ended up putting the dough on a piece of parchment paper that I drizzled with olive oil. 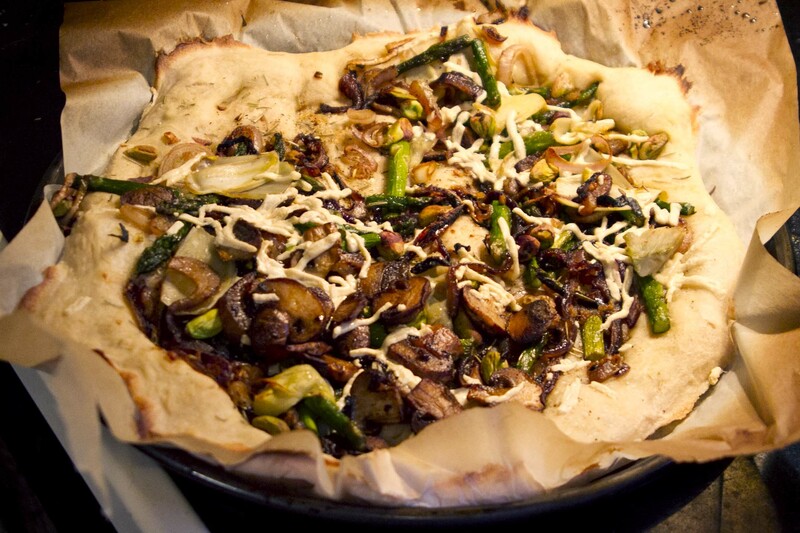 I was able to stretch the dough out on the parchment paper and put toppings on. I tried to gently pick up the parchment paper to place the pizza directly on the pizza stone, but there was no way I was going to be able to transfer it without it sliding off or dropping it. Instead, I slid it onto a metal pizza pan and put that on top of the hot pizza stone in the oven. His recipe calls for baking the pizza for only 3 minutes, however I ended up baking it at 500° for 5 minutes, then lowered the temperature to 450° and baked it for another 10 minutes until it looked done. The bottom of the crust turned out really well. Despite being hard to work with, I think this is the best pizza dough I’ve made at home. It was nice and crispy, but firm enough to hold all the toppings. The edges were still a bit doughy, but good. If I’d been able to stretch it out further, I think the edges would have been crispier as well. I would definitely make this recipe again and play with the amount of water to flour to get a more flexible dough. The toppings were a perfect combo that I will definitely try again. The asparagus, pistachios, red onion, and artichoke went especially well together. Next up, I want to try the pizza recipe from the book The Bread Baker’s apprentice. Do any of you have favorite pizza dough recipes or toppings I should try? Update: I made this recipe again and it turned out perfectly! If you stick to the exact amount of water in the recipe, it will seem dry as you’re mixing it, but don’t add any extra water. Just keep folding it and it the extra flour will eventually incorporate. This leaves you with a dough that is much easier to stretch out by hand. Stretch the dough into a 6-8 inch round and let it rest for a few minutes, then continue to stretch it out to it’s full size. Place the dough on the pizza stone and pre-bake it for 3-4 minutes. Then take it out and top it and finish baking for 3-4 minutes. This creates a crispy, but still chewy soft crust. Prepare the dough ahead of time and let it rise overnight for about 18 hours. Once it’s ready, place your pizza stone in the oven and preheat the oven to 500°. Snap off the ends of your asparagus and break or cut the stalks into bite sized pieces. Thinly slice the red onion and shallots. Press or mince the garlic. Saute the asparagus, onion, shallots, and garlic in a little olive oil. Stretch out the dough being careful not to put holes in it. If you do, try to patch them up. As I mentioned earlier, I had the best luck stretching the dough out on lightly oiled parchment paper. 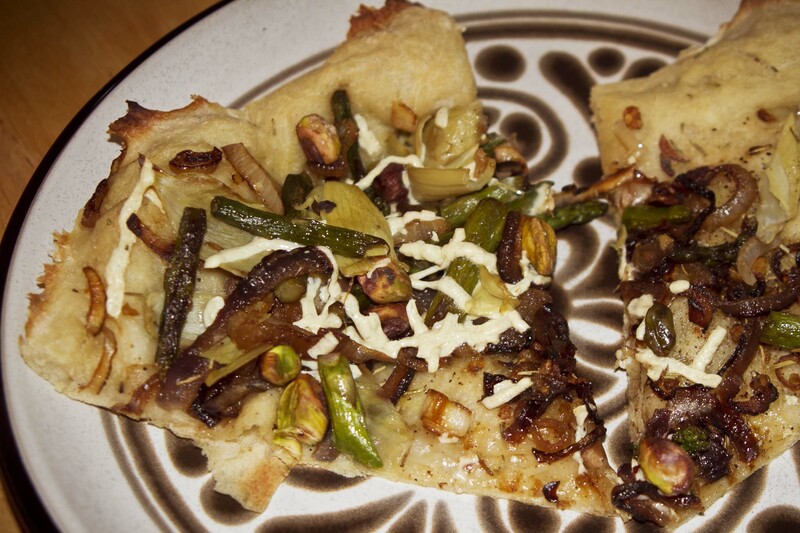 Top the pizza with the sautéed veggies, pistachios, salt and pepper, dried (or fresh) rosemary, and artichoke hearts. If you can, slide the pizza directly onto the pizza stone. Otherwise, place it on a metal pizza pan and then on the pizza stone like I did. Bake the pizza at 500° for 5 minutes. Lower the temperature to 450° and bake 10 more minutes or until the crust looks golden brown.